Now that Apple has unveiled its long-awaited iPad mini, we can see where it fits within the broader small-tablet market based on facts, not rumors. There are a slew of Android-based tablets with screens in the 7-inch range. Amazon, Barnes & Noble, Google (manufactured by Asus), Samsung, and Toshiba each have a tablet that size. 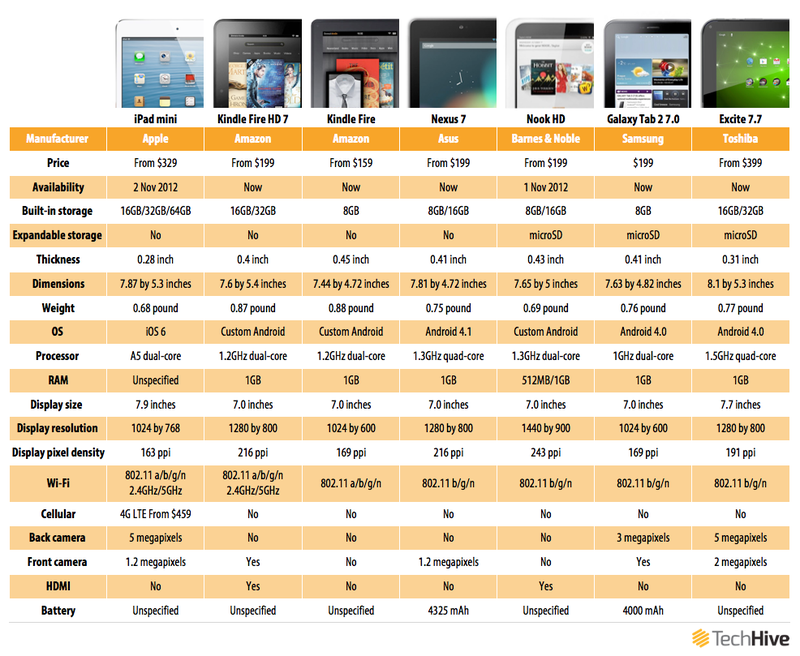 How does the iPad mini compare with them? While Apple's new 7-inch tablet entry will likely find buyers because of the iPad name and the strength of the iOS app ecosystem, the iPad mini's specs and pricing are in many cases uncompetitive with those of other tablets its size. In size, the 7.9-inch iPad mini display is just a bit larger than the one found on the previous leader in this class, Toshiba's Excite 7.7. (That "7.7" refers to the screen's dimensions.) Most other Android manufacturers have stuck with garden-variety 7-inch tablet displays, which may be more economical, but also deliver less screen area and therefore (for many) a less satisfying experience. I've loved using the Toshiba Excite 7.7; that extra bit of display real estate makes a surprisingly big difference. And Toshiba, like Apple, has managed to achieve the extra space without making the tablet as a whole meaningfully larger in size. Where the mini's screen comes up short is in pixel density. After Apple released its third-generation iPad with a high-resolution Retina display in March of this year, one might have hoped that Apple would stick with a high-res screen on the iPad mini. But it didn't, going instead with a standard 1024 by 768 display. Amazon, Barnes & Noble, and Google have all released 7-inch tablets with higher resolution. The high-resolution Barnes & Noble Nook HD. Put another way, the iPad mini's screen provides 163 pixels per inch. That's better than the iPad 2's 132 ppi, but less than every other 7-inch tablet in our comparison. 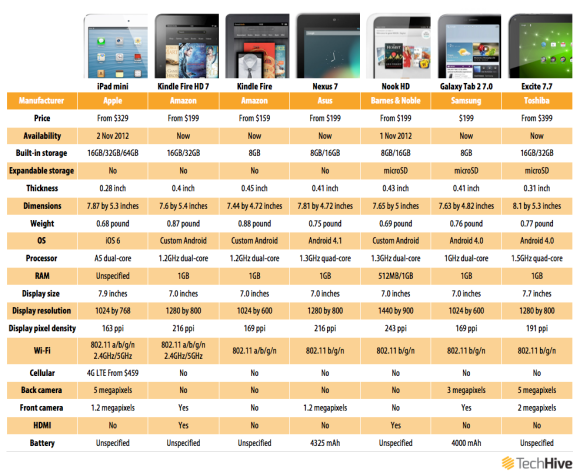 The Kindle Fire HD 7, Nook HD, and Nexus 7 each offer more than 200 ppi. If one of the primary uses for these 7-inch tablets is reading, and if your eyes have grown accustomed to sharper screens, the iPad mini's lower pixel density could be an issue for you. One of the big advantages to a 7-inch tablet is that its size and weight is conducive to extended use in one hand; this comes in particularly handy for reading. As noted earlier, Apple now is the lightest of this size class, in most cases by a substantial amount. (It's lighter than the Nook HD by the narrowest of margins: just 0.01 of a pound.) The mini is also thinner than most: 0.28 inch versus 0.4 or more for all but the Toshiba Excite 7.7 (0.31 inch). As for storage capacity, the iPad mini's 64GB model has more capacity than any other 7-inch tablet. Other tablets max out at 32GB. The base model starts at 16GB; others start at 8GB. And a couple of the other 7-inchers—the Amazon Kindle Fire and the Samsung Galaxy Tab 2.0—go to 8GB and no further. Then there's the issue of price: The 16GB Kindle Fire HD (with its high-res screen) goes for $199; the 16GB iPad mini is $329. Google is expected to introduce a 32GB version of the Nexus 7 that could well replace the current 16GB at the high-end of that product line but still cost $250; the 16GB version would then bump down to $199. Meanwhile, for $230 you can buy the 16GB version of Barnes & Noble's high-res Nook HD. Of course, with any tablet, you aren't just buying a quantity of pixels and storage. You're also buying into the manufacturer's application ecosystem. Amazon's and Barnes & Noble's tablets support only those apps found in their respective app stores; the Nexus 7 supports every Android app available through the Google Play store. The iPad mini, meanwhile, can take advantage of the unbeatable breadth to be found in Apple's App Store. In the end, of course, none of this may matter to you. You may already have made the choice to go with Apple's tablets, in which case the only question is: Which one? But if you're shopping for a small-screen tablet generally, you'll have to weigh the mini's advantage on apps against its disadvantages in pricing and screen quality. Don't confuse the "mini" in "iPad mini" with "lite"--with the exception of a Retina display, this slimmed down iPad gives you the full iPad experience, including access to over 275,000 iPad-optimized apps, in a device that's about half the overall size and weight of the standard iPad. Retina-display purists will (justifiably) balk at the 1024-by-768-pixel screen, but I suspect that most people will be wowed enough by the iPad mini's other features, performance, design, and build quality to accept the screen for what it is--very good, but not Retina.